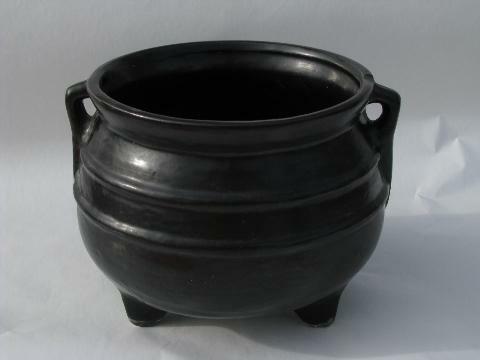 vintage pottery planter, black iron kettle, witches cauldron for Halloween! Vintage pottery planter made to look like an old cast iron kettle, measures about 7" in diameter across the fattest part, and 5 1/2" diameter at the rim x 5 1/2" deep. We were told this pattern is made by McCoy, but it's not marked. This one is in very nice condition.